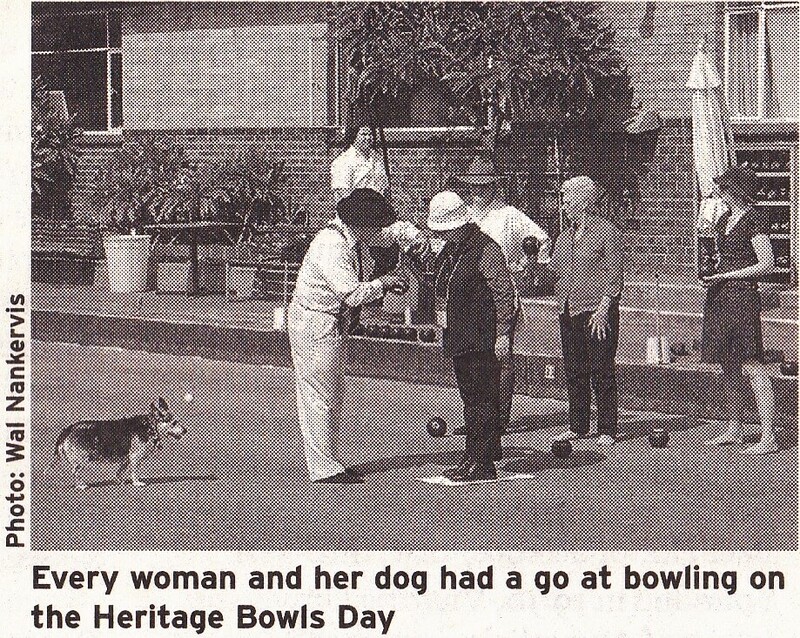 The City of Melbourne Bowls Club was delighted to welcome members and friends of the Hotham History Project to our joint Heritage Bowls Day on Sunday 20th March. The spirit of 1905 came through in the background music and the appearance of those who dressed for the occasion. The club's history was displayed — original minute books from 1866 onwards, photographs of past presidents and players dating back to the 187os, and items like the souvenir of his 1922 UK bowls tour, presented to the club by Baron Marks, a former club president. Bowls were enjoyed by all, with spirited participation by novices, imaginative coaching and some helpful commentary from the observers. Speeches from Lorna Hannan (chair, Hotham History Project) and Cliff Noonan (club president) evoked our past, with references to the wider area of Hotham as well as the long history of the Bowls Club. During her speech Lorna formally announced that the Hotham History Project and the City of Melbourne Bowls Club would work together to write and publish a history of the club as part of the Annals of Hotham. Anyone interested in this project (contributing or learning more) should contact Madeleine Scully on 9326 9402. Hotham Hill, which bears the name of the governor who sent the troops to the Eureka Stockade, is a distinctive part of North Melbourne. Today it is largely residential and bounded to the east and west by the Housing Commission developments and apartments that replaced the early workers' cottages in the middle of the 20th century. Its wide streets, narrow lanes and Victorian terraces — some with multicoloured brickwork, some with rendered exteriors, many with iron lacework still intact—have seen many changes that we can still document quite closely. One of the community events in the let's hear it for Hotham' program was to take a walk around Hotham Hill to see and hear about its history first-hand. The mansion at 519 Dryburgh Street, which was built by Robert Langford, a councillor and mayor of Hotham, bears testimony to the vigour and optimism of our early migrants. Guy Murphy's book At Home on Hotham Hill (the story of this very house) provides detail for those who have their interest aroused. During the two-hour walk, people who had lived in Brougham and Canning streets described the family life and networks that forged a particular loyalty and community spirit that the Hotham History Project hopes to capture in its collection of oral history. Thanks to those who researched and organised the walk and to our informants, without whose input we could not refresh our communal memories. Walk based on the book R-Rated Real Estate belonging to North & West Melbourne by Lorraine Siska and Alan Ashley - 4 June 2005 A report on this walk will appear in the next issue of the News.